The Greatsearch.org instead of your startpage is a sign of appearance of malware from the browser hijacker family on your machine. It can bring a security risk to your PC system. So, do not ignore it! Of course, the Greatsearch.org is just a web site, but the PC infection uses it to rewrite your homepage, new tab and default search engine, without your permission and desire to see it. The Greatsearch.org as your home page can be just the beginning, because your computer is infected by malicious software, that in the future can increase the amount of problems with the Chrome, IE, Mozilla Firefox and Microsoft Edge. Its appearance will prevent you normally browse the Web, and more, can lead to crash the browser. The Greatsearch.org browser hijacker can alter some settings of installed browsers, but often that the unwanted software can also infect all types of web-browsers by changing their desktop shortcuts. Thus forcing the user to see Greatsearch.org annoying web page every time open the web browser. Except that the Greatsearch.org alters internet browser’s start page, it also replaces a search engine, which leads to the fact that use of the web browser’s search becomes uncomfortable. The reason for this is that the search results will consist of a lot of ads, links to unwanted and ad pages and only the remaining part is search results for your query from well-known search engines such as Google or Bing. The Greatsearch.org browser hijacker is not a virus, but the virus behaves similarly. As a rootkit hides in the system, changes some settings of web-browsers, and blocks them from changing. Also this hijacker may install additional browser addons, extensions and modules that will show advertisements and popups. And finally, the Greatsearch.org hijacker may gather user information like what web-pages you are opening, what you’re looking for the Net and so on. This information, in the future, can be transferred to third parties. Thus, it’s clear that the presence of browser hijacker on your personal computer is not desirable, and you need to clean up your computer ASAP. Follow the tutorial below in order to remove Greatsearch.org unwanted search. The answer is right here on this page. We have put together simplicity and efficiency. It will help you easily to clean your PC system of hijacker. Moreover, you can choose manual or automatic removal method. If you are familiar with the computer then use manual removal, otherwise run the free antimalware utility created specifically to remove browser hijacker infection such as Greatsearch.org. Of course, you can combine both methods. Read this manual carefully, bookmark or print it, because you may need to close your web browser or reboot your computer. The tutorial will help you remove Greatsearch.org search. These Greatsearch.org removal steps work for the Firefox, Chrome, Microsoft Internet Explorer and Edge, as well as every version of Microsoft Windows operating system. Some of the steps may require you to close the web-browser or reboot your machine. So, bookmark or print it for later reference. Some PUPs, browser hijacking software and ‘ad supported’ software may be deleted by uninstalling the free programs they came with. If this way does not succeed, then looking them up in the list of installed programs in Windows Control Panel. Use the “Uninstall” command in order to remove them. To save changes, press OK . You need to clean all web browser’s shortcuts. So, repeat this step for the Chrome, Firefox, Internet Explorer and Microsoft Edge. 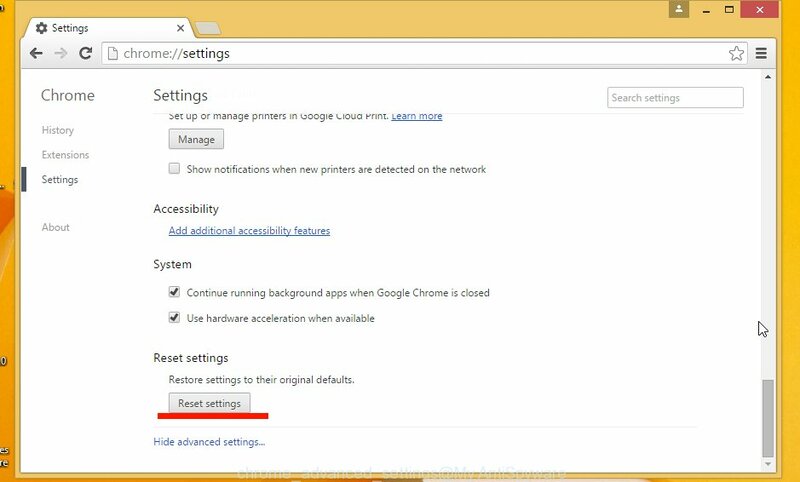 Run the Reset web browser tool of the Google Chrome to reset all its settings such as homepage, new tab and default search engine to original defaults. This is a very useful tool to use, in the case of web-browser hijacks like Greatsearch.org. Click the “Refresh Firefox” button at the top right of the Troubleshooting Information page. Select “Refresh Firefox” in the confirmation dialog box. The FF will start a process to fix your problems that caused by the Greatsearch.org PC infection. When, it is complete, click the “Finish” button. By resetting Internet Explorer internet browser you return your web browser settings to its default state. This is basic when troubleshooting problems that might have been caused by browser hijacker like Greatsearch.org. First, run the Microsoft Internet Explorer, then click ‘gear’ icon . It will display the Tools drop-down menu on the right part of the web browser, then click the “Internet Options” as shown in the figure below. In the “Internet Options” screen, select the “Advanced” tab, then press the “Reset” button. The Internet Explorer will show the “Reset Internet Explorer settings” dialog box. Further, click the “Delete personal settings” check box to select it. Next, press the “Reset” button as shown below. When the procedure is finished, click “Close” button. Close the Microsoft Internet Explorer and reboot your PC system for the changes to take effect. This step will help you to restore your web browser’s startpage, new tab page and default search engine to default state. Many antivirus companies have designed programs that help detect and delete PC infection, and thereby restore all your typical web browsers settings. Below is a a few of the free programs you may want to run. You PC can have a huge number of PUPs, adware and browser hijackers installed at the same time, so we recommend, if any unwanted or malicious program returns after restarting the system, then start your PC into Safe Mode and run the anti malware utility again. We recommend using the Malwarebytes Free. You can download and install Malwarebytes to detect and get rid of Greatsearch.org homepage from your system. When installed and updated, the free malware remover will automatically scan and detect all threats present on the computer. Once installation is finished, click the “Scan Now” button to start checking your PC for Greatsearch.org PC infection. This procedure can take some time, so please be patient. When the scan is finished, make sure all entries have “checkmark” and press “Quarantine Selected”. Once disinfection is complete, you may be prompted to reboot your machine. 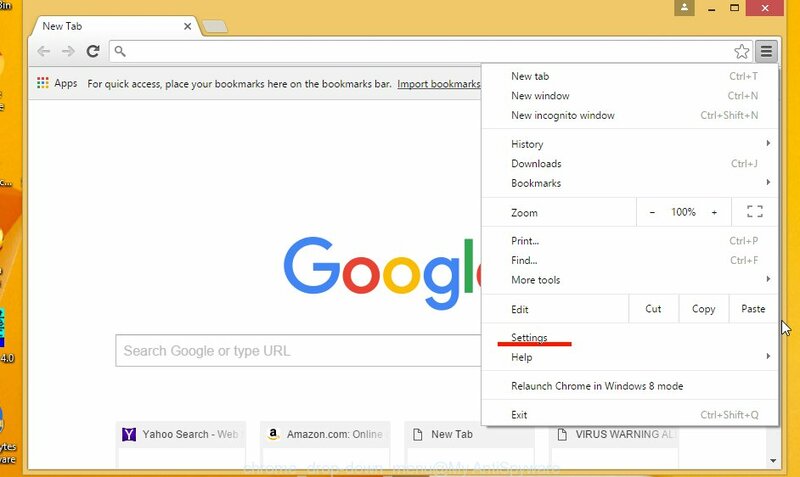 The following video offers a step-by-step guide on how to get rid of browser hijacker with Malwarebytes. If MalwareBytes antimalware cannot delete this hijacker, then we suggests to run the AdwCleaner. AdwCleaner is a free removal utility for browser hijackers, ad supported software, PUPs and toolbars. After the download is finished, open the directory in which you saved it and double-click the AdwCleaner icon. It will run the AdwCleaner tool and you will see a screen as shown below. If the User Account Control dialog box will ask you want to open the program, press Yes button to continue. Next, click “Scan” to start checking your computer for the Greatsearch.org browser hijacker and other malware and ad-supported software. Once the scan is done is complete, it will show a list of all items detected by this tool as shown on the screen below. You need to click “Clean” button. It will open a prompt. Click “OK” to start the cleaning process. When the clean up is complete, the AdwCleaner may ask you to reboot your machine. After restart, the AdwCleaner will display the log file. Enabling an ad-blocker program like AdGuard is an effective way to alleviate the risks. Additionally, ad-blocker software will also protect you from malicious ads and web sites, and, of course, stop redirection chain to Greatsearch.org and simular web-pages. In most cases, the default settings are enough and you do not need to change anything. Each time, when you start your PC system, AdGuard will run automatically and block pop-ups, web-pages such Greatsearch.org, as well as other dangerous or misleading web-sites. For an overview of all the features of the program, or to change its settings you can simply double-click on the AdGuard icon, which is located on your desktop. Now your PC system should be clean of the Greatsearch.org startpage. Delete AdwCleaner. We suggest that you keep Malwarebytes (to periodically scan your PC for new malicious software, browser hijackers and ‘ad supported’ software) and AdGuard (to help you stop unwanted pop-ups and malicious web-pages). Moreover, to prevent browser hijackers, please stay clear of unknown and third party applications, make sure that your antivirus program, turn on the option to scan for PUPs (potentially unwanted programs). If you need more help with Greatsearch.org search related issues, go to our Spyware/Malware removal forum.